Many try to design brand new iPhone concepts focusing on hot specs, bigger and better touchscreens or new features, but we have forgotten that sometimes you also have to “go green” if you want to succeed. 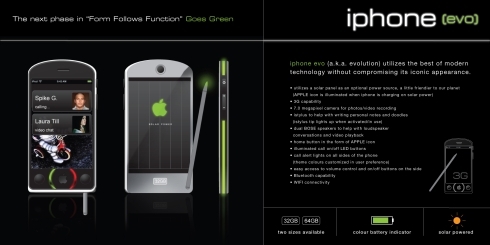 Amy Lam created the iPhone Evo concept, a handset that relies on solar energy, as an optional power source. This phone supports 3G connectivity, features a 7 megapixel camera with support for video recording and uses a stylus that aids the user to write personal notes and doodles. Dual BOSE speakers with loudspeaker are also on board, plus call alert lights on the sides of the phone, Bluetooth and WiFi support. iPhone Evo comes in 32GB or 64GB versions and its designer claims that this handset should stay modern for about 5 more years. Is Apple ready for a more environmentally-friendly attitude?